On average, reels play an important role regardless of the type of fishing you plan to do. However, reels can be even more significant when ice fishing. This is because you will require an ultra-sensitive system to ensure that you are successful in the colder months. Therefore, you need the best ice fishing reel to attach to your rod. If you have been having some difficulty with this, you don’t have to worry any longer. Which Ice Fishing Reel Is Right for You? Ice fishing reels fall into three different categories – inline, spinning, and baitcasting reels. The spinning reel is an open-faced reel that is fitted onto the bottom of the rod. They have a fixed spool and the line is protracted by the load created by bait or tackle. This is arguably one of the most used reels by anglers. This is because it offers a great deal of versatility, is easy to use, and you have a large selection to choose from. Inline reels are quickly becoming a favorite among ice anglers. They are, in fact, an improved-upon version of fly fishing reels. The reel is positioned below, the rod but in-line with it. While the reel borrows the setup of feeding the line from the rod guides to the spool, they do differ in diameters. Last but not least, you have bait casting reels. Despite not being utilized all that much, this type of reel has been around for quite a while. Baitcasting reels can be quite heavy as they have larger baskets. They also have spools that can adjust from left to right. The main reason that this is a more popular reel is due to the expertise and skill required to wield it. Now that you are aware of the various types, it is time to consider which might be a good fit for you. To get it out of the way, let’s first consider the baitcasting reel. Now, as mentioned before, baitcasting reels are heavy and can be difficult to manage if you are a novice. However, if you do figure out how to use one, there are several advantages. For instance, despite being heavier, these reels are excellent for catching large and vigorous fish, particularly lake trout. This is because they allow for greater control and precision when casting and reeling the fish back in. The real matchup exists between the spinning reel and the inline reel. You can’t necessarily crown one or the other the winner. Rather, you will need to take a look at how you are fishing and what reel will best accommodate it. First things first, which type of reel would endure the conditions related to ice fishing the best? If you want smooth, continuous performance from your reel, regardless of the temperature or length of trip, you will be better off with an inline reel. Since the various components aren’t all that close to each other, you will not need to worry about it locking up, should water get in. Also, should the cold cause the gearing to freeze up, inline reels tend to thaw quite a bit faster than spinning reels. 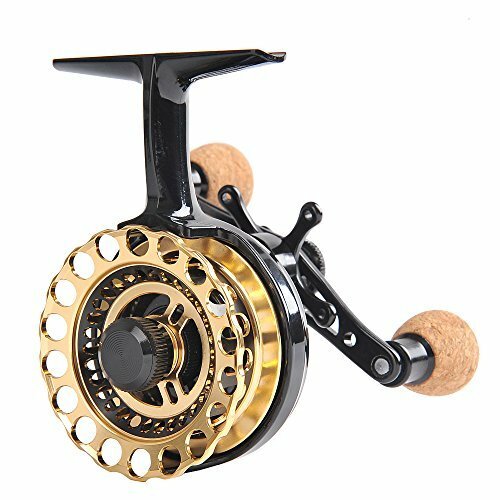 Of course, if you are looking at expertise levels, then you will probably find that the spinning reel is a better choice for you. This is because it is simple to use and doesn’t require a great deal of skill. So, you will be able to start fishing almost right away. Not to mention, spinning reels are often more versatile, making them suitable for a variety of fishing conditions and situations. The next point to ponder is the size of the fish that you hope to catch. If you are focusing on panfish or smaller prey, then the inline reel will be of advantage here. Especially if you are fishing in a shallower area. On the other hand, if you want medium to large-sized catches, a spinning reel is the best choice. If you like using live bait, then you will find that spinning reels are up to the task. This is in no small part due to the excellent drag adjustments available with this type of reel. If jigging is more up your street, then inline reels are undoubtedly the reel to consider. After all, one of the main advantages of an inline reel is that the line does not get twisted or turned while lying on the spool. So, jigging the spool can spin freely without the need for constant turning. Durability: since the reel will be exposed to water, ice, and freezing temperatures, you will need to ensure that it can withstand all of this. For this kind of environment, you should look for reels that are made of either aluminum or graphite. Anti-freeze Feature: as you can imagine, freezing is the main concern with ice fishing. With this in mind, you should look for a spool that has been treated with some form of anti-freeze lubrication. This will allow you to keep fishing with fewer interruptions. Reduced Friction: if you want the reel to operate smoothly, you need as little friction as possible. Well, this is where the ball bearings come into play. They help to oppose the drag load which is why, the more ball bearings there are, the better. Weight: typically, it is best to opt for a lighter reel. This affords you greater flexibility and movement. Not to mention, you are also less likely to get tired after hours of carrying it. The one thing that can’t be denied about the Pflueger reel is that it has been beautifully designed. To start with, it has a five bearing system that is made of anti-corrosion stainless steel ball bearings. This means that regardless of how cold it gets while you are out fishing, you don’t have to worry about any of these parts freezing up. This way, this reel is actually quite reliable. Now, some may see the reel’s graphite construction as being a bit of a letdown. Sure, while this might not offer the greatest amount of durability, you are rewarded with an incredibly light reel. As a result, you can fish for longer periods of time, at a stretch. While the frame itself may not be the strongest, it is supported by an aluminum bail wire. This prevents the reel from bending, even in frigid temperatures. The other feature that stands out about this reel is just how well it performs, drag and all. So, you will actually be surprised about the kind of fish that you are able to reel in. You may find that the larger fish are less of a challenge as well. While the Daiwa D-Spin reel hasn’t specifically been designed for ice fishing, it nonetheless performs incredibly well under those conditions. If you truly want to experience all that this reel has to offer, you should use it with an ice fishing rod. The main feature of this reel is its incredibly low weight. Now, the most obvious advantage here is that it reduces fatigue and allows you to fish for longer. However, this reel also allows you to use a lighter line and thus, get a much better feel for fish, particularly when fishing for smaller species. The drag on this reel is also quite good and smooth enough to make the reel easier to handle. The housing of the reel is made from composite material. So, while it may not have the strength of a hardier material, it does have the benefit of continuing to work smoothly in icy conditions. The composite material prevents the reel from freezing up too quickly. Since this is a spinning reel, you are going to have to expect some issues while jigging. For instance, it is not uncommon to feel some resistance when fishing with jigs. 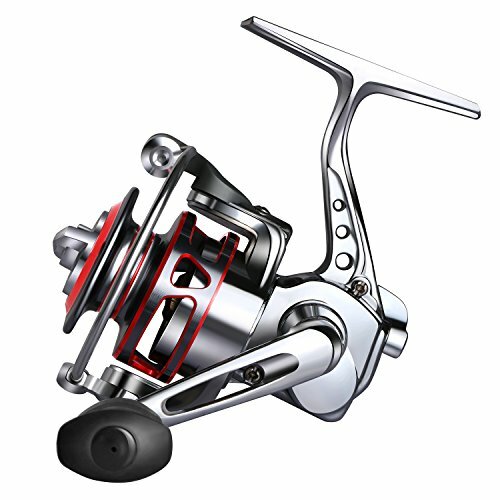 If you are looking for a quality fishing reel for a reasonable price, the Goture reel will provide what you want. It is hard to imagine this considering the reel is made from such tough substances. The housing of the reel and the handle are composed of machine-constructed zinc alloy. The spool is made of high tensile aluminum and the main shaft consists of reinforced steel. This means that this isn’t the kind of reel to lock up or stop functioning, just because it is exposed to freezing temperatures for a long period of time. The unfortunate thing about all these quality materials is that they are quite heavy. As a result, so is the reel and you may not be able to handle it for long before your arm begins to get tired. The reel also has a decent number of ball bearings which keep the entire reel running smoothly. To top it off, it is incredibly easy to switch the reel from left hand retrieval to right. This allows multiple people to share it as well. You will also find that this reel is easy to store since it is complete with a collapsible handle. Not only does the Fiblink reel offer quality, you also get a reasonably stylish and eye-catching reel as well. This is one of the few spools, at this price point, that is made from aluminum – To make it even better, it was constructed via a machine, so that you can be quite sure that the entire design is quite precise. Speaking of the spool, it also has a large line capacity and with the push of a button, you can release it. Overall, despite the durable materials, this reel is relatively light. 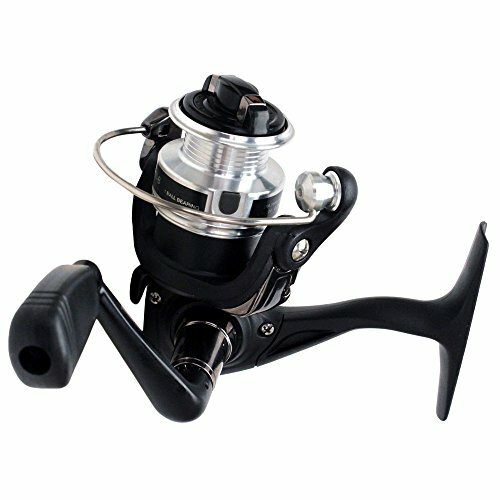 Now, this fishing reel has a smooth drag although you will not need to rely on it as much as you imagine. This is because the reel is also equipped with an anti-reverse switch. Now, you will be able to wrangle large, thrashing fish in without the fear of losing them. To reduce the friction even further, the reel has 4+1 ball bearings too. However, the one thing that stands in the way of making this reel truly top-notch is the lack of a fender. So, if you do want to use the palming method, you will find that you are constantly rubbing up against the spool. The one thing that you will almost immediately notice about this reel is that it has been specifically created for cold conditions – This is going to be a reel that lasts more than a few winters. For example, the reel includes cold gear lube so even when the temperatures drop considerably, you will still be able to use the reel without having it locked up. This isn’t the only thing that makes the reel so perfect for ice fishing. It is also incredibly durable with the spool being constructed from machined aluminum and there being a tough bail system in place. This is also a good reel if you are looking for greater control and precision while fishing. Thanks to the Rocket Spool Lip design, there is much better control over the line that is coming off the spool. 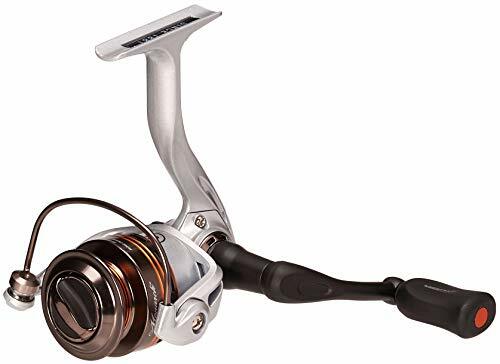 The other benefit with this spinning reel is that regardless of the size of the fish that you are trying to reel in or how much of a fight they put up, retrieval will be a breeze. Not only does the reel have three ball bearings, it also has an anti-reverse bearing which allows you to be in charge at all times. Now, inline reels are best known for their lack of line twist. This Eagle Claw ice reel certainly lives up to this reputation even when you have a particularly violent fish at the end of your line. This means that you can fish uninterrupted as you don’t have to keep fixing your line. 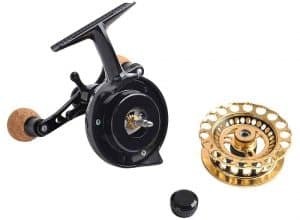 The other notable thing about this reel is that it boasts a Teflon drag system which is easy to adjust, making the overall operation of the reel incredibly smooth. Once set, it remains constant until you are ready to change it again. 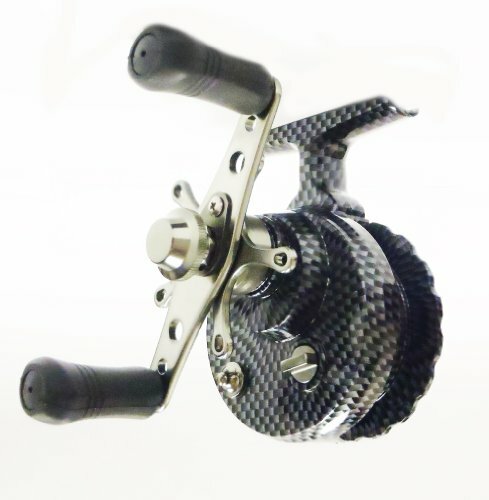 One of the concerns regarding this reel is the fact that the body, as well as the spool, are made of nylon. Now, so far, I am yet to deal with any issues regarding its durability. At the same time, it is difficult to determine whether this material could handle much lower temperatures. The good news, however, is the handle is made of tougher aluminum. It is also complete with a non-slip grip, making the reel easier to hold onto. This is also a rather versatile reel, considering that the left hand retrieve can quickly and easily be changed to the right hand retrieve at any time. There is no doubt that the Eagle Claw Inline fishing reel is the winner here. It just has so much going for it, particularly considering that you can cut down on line twist with it. 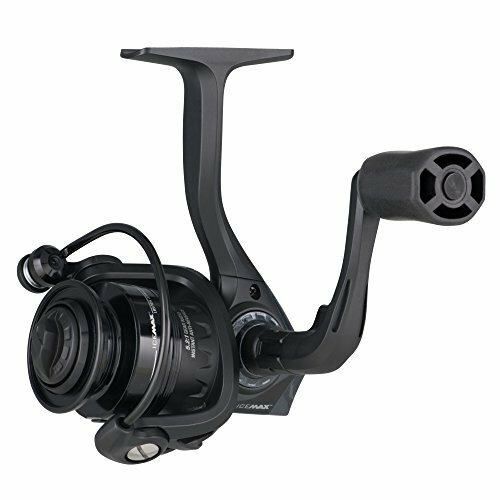 At the same time, this reel rewards you with a smooth drag and incredible performance. This is the type of reel that practically anyone can use – regardless of expertise level or even retrieval preference. It doesn’t matter whether you prefer left hand or right hand retrieval, this reel can be adjusted to one of your choosing within a matter of minutes. To top it all off, it is available at a really reasonable price as well. This article will give you an idea of what you need to look for in an ice fishing reel as well as a hint to picking the right one. What Is The Best Ice Auger For Ice Fishing? Surprising Spring Trout And Salmon Technique To Land Fish Right Now!